Chilly days in the quiet woods…the summer birds have flown south and the squirrels don’t have much to say. Raven calls echo in the distance, and there is the muffled tap-tap of a woodpecker on a tree trunk. Hiking in to the work site in the morning, boots crunch on ice crystals growing out of the wet earth. My eyes go for contrast: the leathery green kinnikinnick leaves are vibrant against the remaining red huckleberry bushes. Rain-plumped mosses flow over rough boulders and fins of rock. It’s a visual feast. The cold weather makes us hungry. People root around in lunch bags for snacks, and we all agree to eat lunch a little early. At the end of the day, I fall behind the others. My trail days are numbered, and I want to savor some of the last hiking on dirt. Soon there will be six feet of snow on this trail. Soon I will be spending more time in the office, making the transition from summer to winter work. I walk as quietly as I can. There is a soft sound and movement behind me. I turn, and vine maple leaves are winnowing to the ground. A puff of air and a few more release from their twigs to twirl nearly weightless until they rest on the earth. Fall is about letting go; about landing as gracefully as possible. Hi Deb Since coming home from Fish Lake we search for a nice day and take a hike. Our side is so full of trees we often hike in darker forests. Lots of moss, running streams and soggy blueberries. We went to Mt Pilchuck’s Heather Lake. It seems trails have become steeper and longer since we were there 10 years ago. It is wonderful to get out because many indoor days are just arounds the corner. We enjoy reading your blogs and the pictures. We feel we are almost on your work hikes with you. Thanks for sharing your talent. Hi Deb. 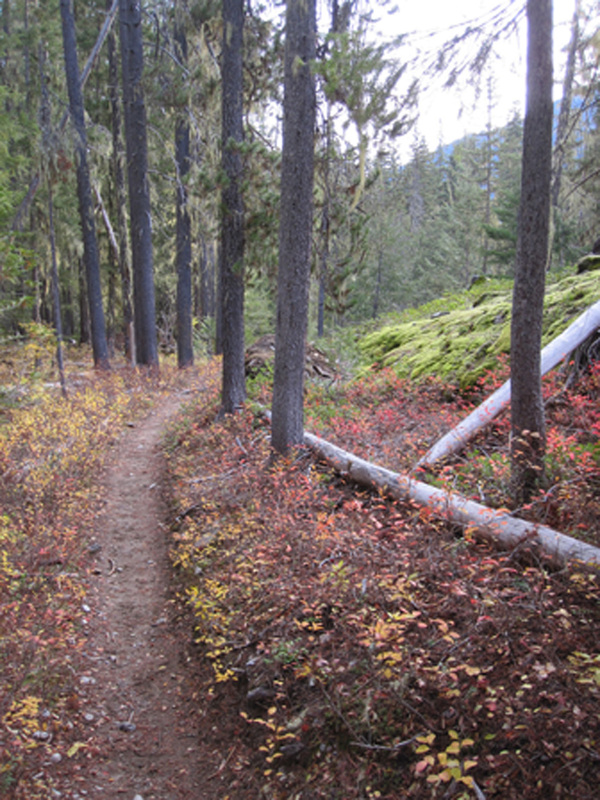 I met you at the North Cascades “Art of the Essay” weekend and am enjoying your blog. I’m busy with my inside job teaching and really appreciate your lovely descriptions of the autumn trails. Your words transport me there. Thank-you.